Water is essential for life – this applies to all forms of life including you and your pet. In fact, most of the human and animal body is made up of water. So, always make sure you have a plentiful supply of fresh water available for your pet – it doesn’t matter if Tucker slops it all over your kitchen floor – just be happy that he’s drinking because pet dehydration is a serious problem. 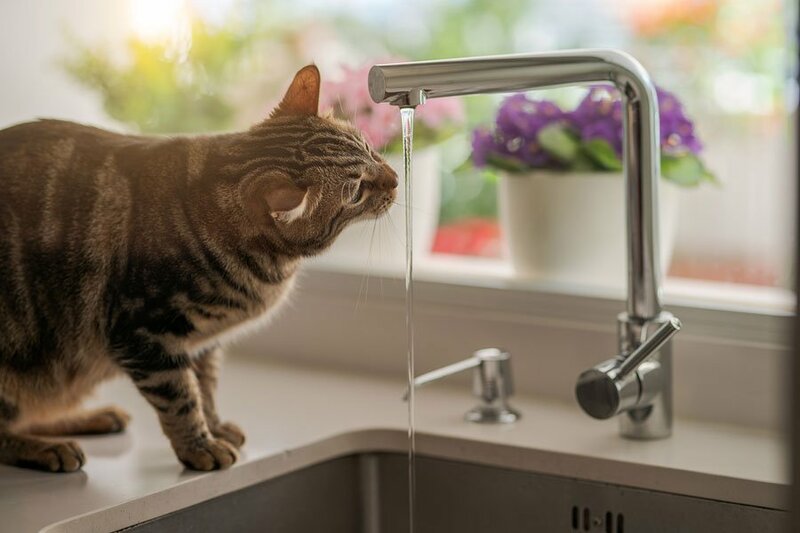 While feeling thirsty is one of the ways to remind a pet to drink some water, dehydration is a potentially life-threatening condition that is not always preceded by thirst. Another way to describe dehydration is low circulating blood volume. Dehydration reduces the volume of blood and intracellular fluids flowing through the body. This in turn adversely impacts the amount of oxygen that is delivered to the tissues and organs. When Does Pet Dehydration Occur? How do I Get My Pet to Drink More Water? There are many ways to encourage your pet to drink more water. Some pets may prefer drinking out of a water fountain or running tap water rather than a water bowl. Leave some water in the bottom of a sink, bathtub, or shower. Curious cats like to visit such locations. Include some moist canned food in your pet’s diet. Cats on dry food only menus are particularly prone to dehydration. Place your pet’s water dish adjacent to the food dish. Add water to the food. Moistening food (especially kibble) enhances water consumption and helps with digestion. Put out more water bowls. Try using different types and depths of water dishes – ceramic and metal. Make ice cubes out of fish or meat broth. Then, place the broth cubes in your pet’s water bowl to “flavor” the water. How Do Vets Treat Severe Pet Dehydration? The most effective veterinarian treatment for dehydration is to place the pet on a drip. The drip will replace any fluids already lost and also prevent further dehydration. Be aware that a severely dehydrated pet constitutes an emergency situation. If the pet isn’t rehydrated as soon as possible, death can occur very quickly. If you live in or near Columbia South Carolina, rush your dehydrated pet to CVETS.